There are very few ‘holy grails’ in terms of investment products around the markets and ETFs are certainly not one of them. They won’t make you rich nor will they make you poor, they are simply a vehicle to enact a specific market view. We touched on negatively correlated ETFs yesterday morning which are actually fairly simple in their structure, using futures contracts to offer a ‘short exposure’. Stock ETFs, particularly yield focussed ETFs are more complicated and require some more in depth thinking / analysis. Generally speaking most ETFs are very simple / straight forward in their structure, are designed only to track an index or theme in a low cost way, while some are more complex and have a specific strategy behind them and are therefore more like managed funds. In short, we like the simpler ones and would avoid the more complex ‘strategies’ that are finding their way into the ETF world. 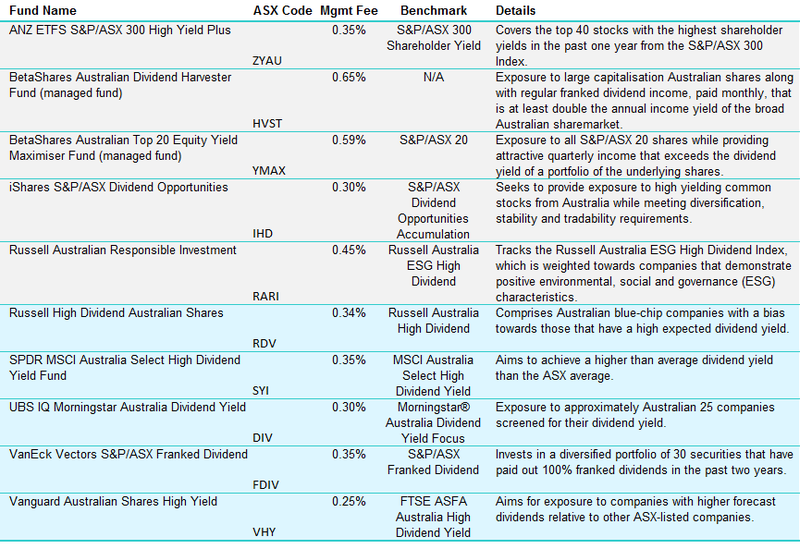 Below is a list of income focussed equity ETFs as a starting point, but more work is certainly required. For instance, the first ETF on the list (the ZYAU) is reasonably new having commenced in 2015, has $48m invested so is reasonably small, average daily turnover of 24k units, however in terms of liquidity the number to look at is the implied liquidity based on the underlying holdings of the ETF, in this case, the implied liquidity is $78m per day as the shares underpinning it are liquid. As an investor looking at that ETF for income it might come as a surprise that they hold 10% of the fund in South32 (S32), a big position in a volatile company with no consensus data on the expected dividend through Bloomberg. 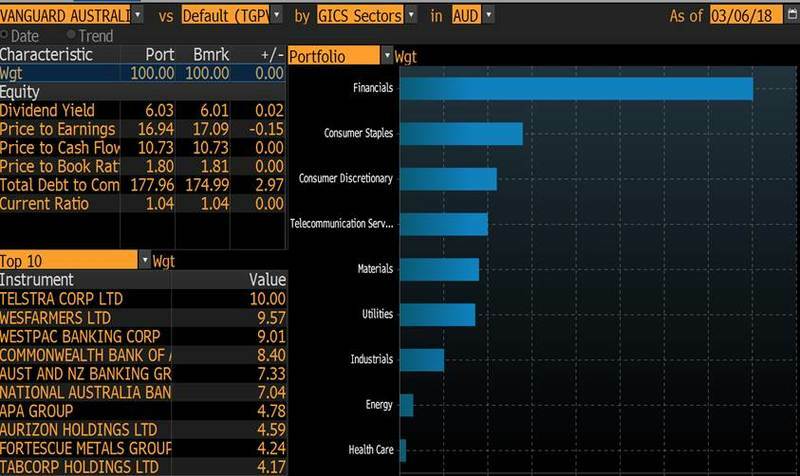 That holding has been a major contributor to the funds ‘outperformance’ this financial year with the ETF producing an annual equivalent return of 12.09%, however given almost 50% of the ETF is held within the 5 top stocks, this is clearly a concentrated fund, something which is not obvious when glancing at its description. Concentration is not necessarily a negative and in this instance, over that time frame it has underpinned very good performance so kudos where it’s due, however concentration will create volatility in returns and ultimately a higher risk product than a larger more diversified fund. 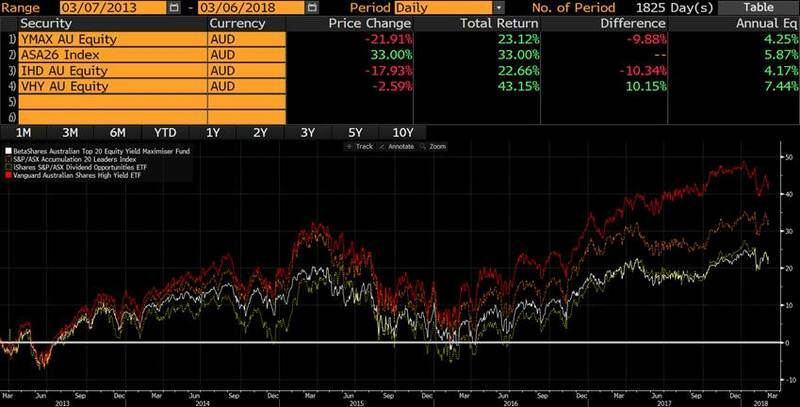 The other ETF that stands out for strong performance this financial year to date is the Russell Australian Responsible Investment ETF on an annualised equivalent of 10.13%. This has $68m invested, average volume of 6k units per day and an implied liquidity of $6.1m. In this instance, the funds holds a position in Spotless (SPO) which is illiquid and that reduces the implied liquidity number. The issue / question from our perspective is, what is an investor actually getting, what ‘value add’ is there in a fund like this given they simply hold the 4 banks within their top 5 holdings and rebalance twice a year? After all, they charge 0.45% pa for the privilege. The 3 most popular Income ETFs are the Vanguard (VHY) which has $1bn invested, the Betashares (YMAX) which has $395m invested and the iShares (IHD) with $260m invested. All of these have good liquidity with the Betashares YMAX on track to book the best performance this year. That fund is currently up 5.94% financial year to date, has an average yield of 6.77% and a P/E of 15.72, or in other words, metrics that are very much in line with the overall market. To us, these are hardly exciting metrics for the 0.59% fee being charged, while if we look at the longer term performance, it has trailed it’s benchmark by an aggregate of 9.88% since inception in 2013. The best performer in the income space over 5 years has actually been the Vanguard Fund (VHY) which has outperformed the accumulation index by ~2% annually before fees, and this is the ‘cheapest’ of all the funds with a 0.25% annual fee. It’s also the most liquid. While the growth in ETFs can’t be denied, we find it hard to get excited about equity income ETFs in aggregate. Cheap international exposure is another area where ETFs can be beneficial and we’ll cover those in future reports.